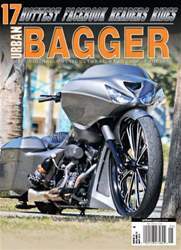 The May 2014 issue of Urban Bagger features the top 17 bikes from our Facebook Readers Rides contest featuring readers rides from all over the country, Canada and as far away as Norway. Our in-depth tech features include products from Drag Specialties, Arlen Ness and Covington's House of Baggers. This issue also features individual buyers guides on Gauges, Electronics and Lighting. The Cover bike is from Stonecutter Customs.